This blog is about my life. My life consists of working as Principal of Hobsonville Point Secondary School, doing crazy sports and recreational pursuits with the Opotiki Opossums and anyone else and keeping an eye on what my family is up to. They all surprise me. I'm loving the kōrero flying around about the hierarchy of skills, knowledge, competencies and capabilities. Much cleverer people than me are making strong contributions to the kōrero but I'm doing my best to make sense of it for me. I got a bit confused observing the kōrero between @briarlipson and @ThomasHaig (and the others who contributed) because I couldn't quite understand the equation knowledge = skills, or was it the other way around, or if you couldn't have knowledge without skills, or skills without knowledge, or if you were allowed to have both, or if one was more important than the other. Most of all I loved how she argued for the place of knowledge and skills. She claims what are most important are Competencies and that to be strong in them you need to build knowledge, learn and develop skills and explore attitudes and values. This makes more sense to me and is helping me grapple with the kōrero that is circulating. I think Valerie Hannon and Elizabeth Rata might disagree on the actual 'what' of knowledge in the type of learning we need to create the world we want. In The Basic Flaw in our Education System she argues for the English Curriculum to be standardised. I wasn't sure what to make of it as I am not an English teacher but I did enjoy Gillian Hubbard's response in her article English teaching not perfect, but it works. Her observations are certainly what match my experience of working with and observing English teachers and learners in English classrooms over many years. 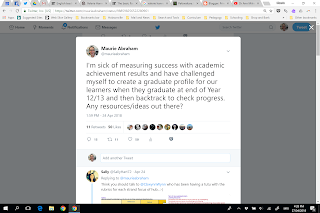 And amongst all this I have personally been grappling with my dissatisfaction and frustration with how we measure achievement. This long-simmering frustration was spurred along by some recent input from Dr Ann Milne who has focused the light quite clearly on the total cultural inappropriateness of how we traditionally measure achievement. I desperately want to find another way of measuring a different, but more appropriate, both culturally and for-the-sake-of-our-planet-and-future-for-our-kids, type of success. I made the mistake of mentioning this at our last BOT meeting so this challenge has now been formalised into my appraisal! I have been inundated with suggestions and support with many wanting to be part of the conversation. I'm collecting all of the responses with the hashtag #gradprofile and would welcome more contributors. Then amongst all this excitement I wake to read in the NZ Herald a story under the headline Wellington School to completely drop NCEA in favour of Cambridge exams. The principal's comment that her school would be "the first in Wellington to drop NCEA" reminded me of the Monty Python 100m dash for people with no sense of direction when one of the competitors headed off in the opposite direction. (Go on! Watch it!). She was also quoted as saying that amongst her students she "saw lethargic practice" and that her learners were often saying "achieved is enough." I respectfully suggest that it is not the qualification that determines practice or learning motivation, it is the culture of a school and it's approach to the design of learning. At the conclusion of the article she states she is "pretty confident they will do really, really well." I'm sure they'll do really, really well in Cambridge. I hope they'll do really, really well in the world described so well by Valerie Hannon. At least the principal claims she's "not afraid to take a step forward"! I suppose it's all about what you are moving forward to. Undoubtedly, a worthwhile article allocated by you. I loved reading your thoughts in English and the way you convert your thoughts into this interesting article is appreciable. Keep blogging. Ros O Brave New School! Ehara taku toa i te toa takitahi, he toa takitini. The success is in the collective. Heemi Grassroots Education | At the grassroots. Thoughts, ideas, experiences and general musings about education. The School that Story built. Cindy Wynn teacher lab: adventures in teaching and learning. Response to This Way Up (RadioNZ): Wearables and weight loss: how well do they work? HPSS Big Projects: Ok, the big question... what is a Big Project at HPSS? What does 'collaboration' look like in Big Projects?